Afghanistan appears to be getting drier: Since the 1996 drought many traditional irrigation sources such as springs, streams, rivers and man-made subterranean aqueducts have been drying up in the southern provinces, according to the Ministry of Agriculture, Irrigation and Livestock (MAIL). A succession of dry years in 1999-2004 and the severe drought of 1999-2001 substantially reduced cultivated areas in the south and east and put great pressure on grazing land, says Afghanistan's Environment 2008 joint report by Afghanistan's National Environmental Protection Agency (NEPA) and the UN Environment Programme (UNEP). "Ecosystem services, soil water content, and conditions of rangelands are most affected by climatic hazards and changes. The effects on food crops and livestock are similarly high. Irrigated agriculture, livestock herders and dry land farmers are considered the most susceptible to the impacts of weather hazards and climatic changes," the report said. Many farmers are battling persistent drought, which has also affected subterranean aqueducts known locally as `kareze’ or `qanat’, which channel water from underground aquifers for use in irrigation. “Drought has destroyed more than 80 percent of `kareze’ and springs in [the southern province of] Kandahar,” the head of MAIL in Kandahar, Abdul Hai Nemati, told IRIN. “This has devastating impacts on agriculture and rural livelihoods,” said Baba Jan, 59, a farmer in Arghandab District, Kandahar Province. A 2009 report - funded by the UK’s Department for International Development (DFID) and written by the Stockholm Environment Institute (SEI) entitled Socio-economic Impacts of Climate Change in Afghanistan - said increasing desertification and land degradation were likely: "Drought is likely to be regarded as the norm by 2030, rather than as a temporary or cyclical event." Many farmers in the south of Afghanistan irrigate poppy fields by groundwater, due to drought. "The vulnerability of the agricultural sector to increased temperatures and changes in rainfall patterns and snow melt is high. Increased soil evaporation, reduced river flow from earlier snow melt, and less frequent rain during peak cultivation seasons will impact upon agricultural productivity and crop choice availability," the report said. Crop failure levels due to water shortages and the amount of potentially productive land left uncultivated will probably increase. 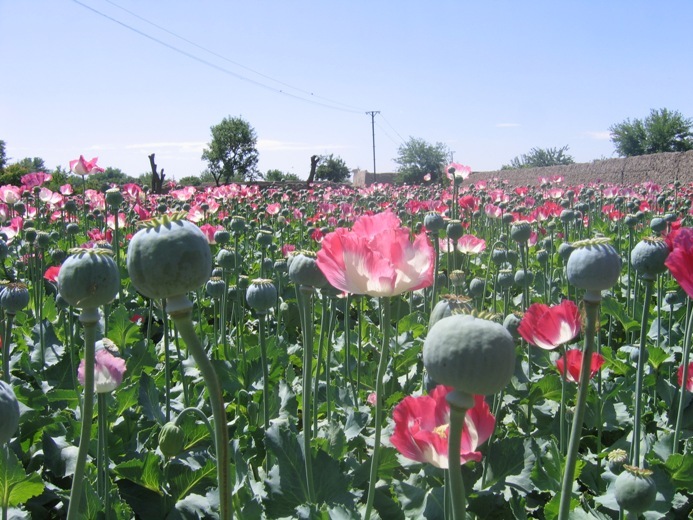 More water intensive staple crops will become less attractive to farmers, with a likely increase in the attractiveness of those that are more drought-hardy, including opium poppy, it added. Some 80 percent of the country’s 28 million people live in rural areas and depend on agriculture, according to the NEPA/UNEP report. MAIL officials say Afghanistan has enough water for irrigation and other needs, but the UNEP/NEPA report says “functional irrigation systems are running at about 25 percent efficiency against their potential of 40-60 percent.” Lack of investment in irrigation systems, lack of modern irrigation tools such as pumps, and a lack of awareness among rural farming communities were to blame, it said. “Sometimes farmers waste some 30 percent of the water while irrigating a field,” Abdul Haq Rashiq, a lecturer at the faculty of agriculture in Kabul University and an agronomist, said. The drying up of irrigation sources and poor irrigation management have forced more and more families to consider leaving the land to seek alternative livelihoods. Some are selling livestock and land in order to dig deep wells, buy power generators and water pumps and irrigate other land for fruit trees, said MAIL’s Nemati.